Thanks a bunch for giving us a solution for what we are worrying about!!! Thank you Septo-Clean for the peace of mind!! Septo-Clean Limited manufactures natural source nutrient products designed to create and maintain high levels of healthy waste digesting bacteria in treatment systems such as septic systems, outhouses, composters, and animal waste treatment from kitty litter to manure systems. The resulting directed digestions are efficient in rapid liquefaction of solids while preventing the development of offensive odours. This has been the company mission since 1963. Ingredients, packaging, and labour are all sourced within Canada. 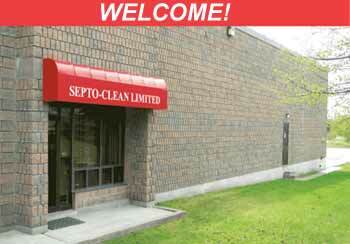 Septo-Clean Limited is 100% Canadian owned and operated. Products are sold through retail hardware and building supply stores across Canada and offered on this Web site. Also available in Canada at: Home Hardware, TSC Stores, TIM-BR Mart and at your local independent hardware and building supply outlet. You can learn how to live in harmony with that big investment you have under your grass. If you treat the system well by not abusing it, it should outlast your need for it. Septo-clean provides a safe and effective means of delaying septic system failure. Now is your chance to get our famous and funny artoons for your own wall.